Not every entrepreneur starts out with the intention of starting a business. Sometimes you find the solution to a problem and you have to share it with the world. That is the case for four students studying global resource systems at Iowa State University. Clayton Mooney, Elise Kendall, Ella Gehrke, and Mikayla Sullivan are chipping away at an age old, big issue — world hunger. And their company started production in a familiar entrepreneurial fashion — in a garage. In the Midwest, especially in Iowa, producing food has always been center stage. However, because food is a perishable, there is much food that is wasted worldwide that could be used to help solve the hunger problem. Until KinoSol was formed. 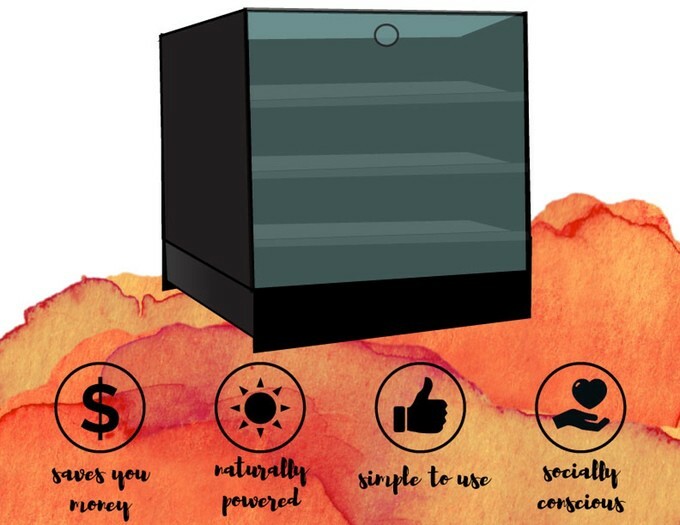 Instead of creating a product or service that increases food production, the founders of KinoSol have designed a product that will increase food preservation. Field-testing in Uganda during the summer of 2015 for testing and cultural acceptance. All four members of KinoSol have had the opportunity to go abroad to third-world countries and experience firsthand the conditions and issues in food scarcity faced by these societies. Having seen the repercussions of post-harvest loss and the detrimental effects it had on the communities in those areas, they wanted to help in any way they could. The perfect opportunity was presented in 2014 when the KinoSol founders came together to take on the Thought for Food competition — a worldwide challenge for students to develop a breakthrough idea to feed 9 billion people by 2050. The problem of world hunger had a solution within the problem — food waste. It was a matter of connecting the dots. Solve food waste in countries with no electricity, and world hunger could be lessened too. When the students initially came up with KinoSol, it was as a school project. When their team moved on to the final rounds of the competition hosted in Lisbon, Portugal, they realized they could really be on to something. Their project quickly turned into an entrepreneurial endeavor. KinoSol’s international unit is small-scale and meant to be used by communities and families. This way the produce stays where the nutrients are needed and creates a potential for entrepreneurship on a local scale. 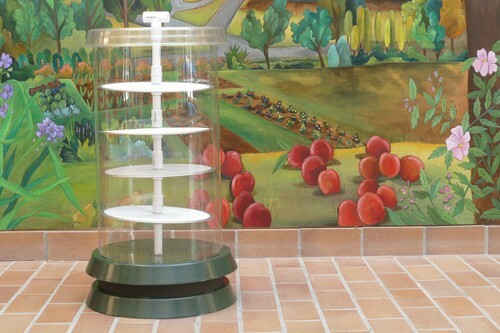 KinoSol produces small-scale, solar-powered food dehydrators. 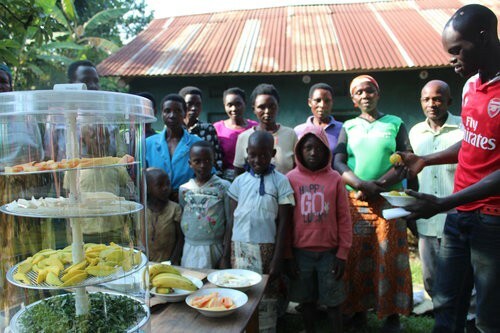 KinoSol units can dehydrate fruits, vegetables, grains, and insects simply with the power of the sun and no electrical outlets. This preserves the food for much longer than it would last otherwise. The first product was built for the international audience as a way to provide for subsistence farmers in developing countries. Shortly after, the Kinosol minds started recognizing there was a similar problem with food waste in the United States — 222 million tons of food goes to waste, totaling over 700 billion dollars each year. This is why the KinoSol team is researching and designing a KinoSol unit for the US market. Note: KinoSol launched their Kickstarter campaign this week! Check the article below to help support the next phase as they build out the domestic unit. 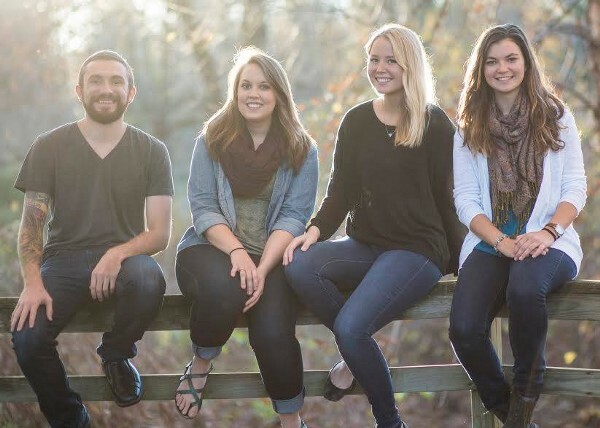 With Ella Gehrke tending to KinoSol partners in Uganda this summer, I got the chance to talk with KinoSol’s other 3 team members to provide insight on the KinoSol journey and their aspirations for the future. How has KinoSol grown since you first started? Clayton: At first, people couldn’t relate to what we are doing because they’ve never experienced developing regions or the struggle of food waste firsthand. As soon as we found our niche market and got just an ounce of traction, things really started to take off. Elise: We went from making units in Clayton’s dad’s garage to working with two manufacturers. Last year, we only had units in one country and now we are in sixteen countries. Mikayla: We are all really good at playing to each others strong suits — we let each other take the lead in the areas that we individually shine. Another big thing is how passionate we are about what we’re doing and people can support that. Elise: Our team gets along well, which adds to the success of running a business. We’re goofy and okay with putting ourselves out there which either results in accomplishments or lessons learned, at the very least. Did you always see yourself as entrepreneurs? Elise: No — starting at the Thought for Food competition was just for fun. I never thought it would turn into anything long-term. We slowly began to realize KinoSol could become a business after receiving a lot of great feedback. During the finals in Portugal, we decided to make the shift and keep pursuing KinoSol even after the competition. Mikayla: I would definitely say we stumbled into the realm of entrepreneurship. Yes, KinoSol is a startup, but we set out to solve a problem. We ended up building a business around our solution. I never thought of myself as an entrepreneur, but I would be completely content staying with KinoSol for the rest of my working life. Clayton: I have a background in corporate America and found that it just wasn’t the right setting for me. Opposite of that, I had a 3.5-year career in professional poker and being self-employed, making my own schedule, and building value through my own methods brought so much more satisfaction to my life. I like the idea of having multiple startups in addition to KinoSol. [Speaking on behalf of Ella] Mikayla: Ella aligns more with Elise and I in the sense that she didn’t expect to become a business owner. Her focus is on decreasing malnutrition and by working on KinoSol now, she can have a positive impact on lives until she gains the technical skills of a doctor. She is on the path to med school. Elise: This next year is going to be a big year for us. Our first domestic unit will be launched next summer and we are currently in the research and design phase, getting pledges for financial support on Kickstarter this week. We will also continue to work with our partners abroad to get good feedback and requests for additional units. Mikayla: In the long run, we all want to see KinoSol make an impact on food waste — even if it is as little as a 1% decrease. It would be great to have KinoSol units in every country to contribute to creating that positive effect. Clayton: I don’t think any of us will be happy unless we see a difference made and reach the millions of people affected by post-harvest loss. We will continue to listen to what people need and potentially expand into other products for different markets. Have you experienced any setbacks? If so, how have you overcome them? Elise: Lack of manpower has been an issue — there is only so much we can accomplish with just the four of us. Also, working abroad can be a huge challenge. Everyone is on a different timeline and communicates differently. When someone says they’ll get back to us in 2 months, we’ve learned it really means 6 months. Knowing this has helped us build more realistic schedules and deadlines. Clayton: We’ve had to learn how to say no and that’s been difficult because we truly want to help everybody. For the sustainability of KinoSol, we’ve had to turn down opportunities of sending units because the funding just isn’t there. Mikayla: To help combat that problem, we’ve launched a Unit Sponsorship Program. It allows people in the U.S. to donate a portion of the cost up to the full cost of a KinoSol unit, so we can send them to countries that need them but cannot afford them. Elise: In addition to that, once we launch our domestic unit, we plan to send a unit abroad for every certain amount sold here. What has been your favorite moment of CYstarters? Mikayla: All of the comradery amongst the startups. We’ve all pushed each other to keep progressing forward and been there to help one another through the ups and downs. We’ve all become really good friends throughout the program. Elise: Being with students who understand the struggles that go hand in hand with starting a business is encouraging. A lot of people can’t relate to what we’re doing, but CYstarters has given us that support system. Clayton Mooney sharing KinoSol’s story at the CYstarters finale event. Clayton: I would echo that it has been great to have a community of student entrepreneurs this summer. One specific moment stands out to me. It was our finale event. Every startup gave pitches on their business — it was cool to see how far everyone has come through this adventure. Elise: Just do it. Sometimes you just have to have faith in yourself because a lot of people will tell you no. You have to put all the negative comments in your back pocket and say “I can do it and I am going to do it.” Don’t get discouraged. Don’t be afraid of failure because those are the best learning opportunities. Mikayla: Never discount anyone you meet — you never know where they can help you in the future. We have gotten some of the best connections from places we never would’ve expected. Clayton: You have to put the “what-ifs” aside because they will drown you in doubt and keep you from getting started. My philosophy is grit and gratitude. Grit will lead to gratitude and with that, success will be inevitable. 2015 Thought For Food Finalist; 2015 Innove Competition Winner; 2015 ISU Innovation Pitch Competition, Winner of Best Social Venture; 2015 TCU Values and Ventures, Lightning Round Finalist; 2015 Values and Ventures, Elevator Pitch Competition Finalist; 2015 Pappajohn Entrepreneurial Venture Competition Winner; 2016 TCU Values and Ventures, 3rd Place Place Overall; 2016 TCU Values and Ventures Ripple Award Recipient; 11th Annual Prometheus Awards, Winner of Student Innovation of the Year; 2016 Young Entrepreneur Convention Elevator Pitch Competition, 1st Place; 2016 CYstarters Summer Accelerator, cohort member;2016 John Pappajohn Business Plan Competition Finalist; 2016 1Million Cups’ 1 In a Million National Competition, Top 40; 2016 WAISLITZ GLOBAL CITIZEN AWARD (Elise Kendall), 3rd Place. Take this opportunity to support KinoSol’s first domestic unit on Kickstarter, CLICK HERE! 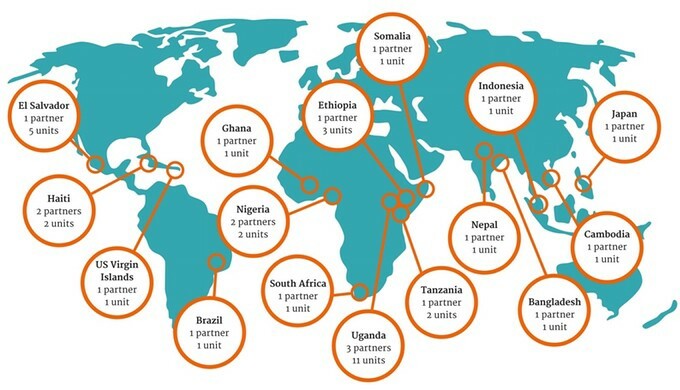 Interested in sponsoring a unit for international use through KinoSol’s partners abroad? To learn more, click here! The design for the KinoSol unit for US markets, launched this week on Kickstarter. 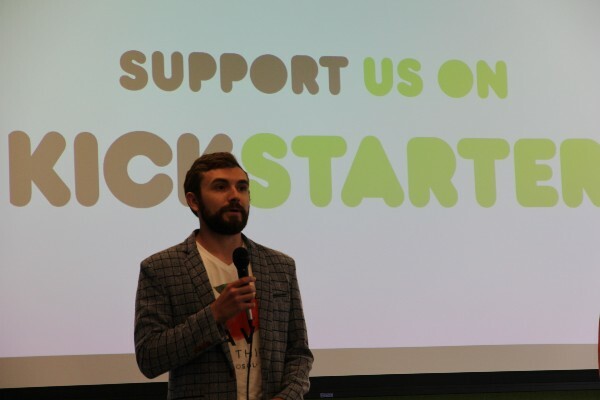 Visit Kickstarter today to learn more about KinoSol.